“Number one is the dedication of the fans, I mean Finland is a true, true metal country. It has true metal fans and it shows every time we play, we can feel this is like something special, this is something beyond you know. It’s just, you can feel it on stage and when you talk to the fans and people. Whenever they were active, ACCEPT have always been on a high. Great quality of music and production on their albums, along with energetic and perfect performances on stage have always been true facts about them. But what makes ACCEPT work so well? “I think there’s a couple of factors. One of them is the songwriting part, Wolf and I have been writing these songs for so many years and we have our little quirky ways how we do it, but what comes out in the end is somehow what defines Accept, from the songwriting part. Not many bass players dare to play a solo on stage, but Peter Baltes has done, which has always received positive feed back from the crowd. “Well we used to do a few bass solos a couple of tours back. It’s not really about the spotlight, it’s a variety for the fans. If you’re in the audience and you see a show, in the old days there used to be a guitar solo and a drum solo. A bass solo was a little unique, but it was something cool we could offer. We decided now it would be much cooler to have some sort of battle going on instead of play a bass solo – have a little guitar bass battle with Wolf going on, which I win every night (laughs), I’m just kidding. Those fans who followed the band from the beginning know that Peter also did some lead vocals on tracks such as ‘Primitive’ and ‘The King” and a few more. But would it be possible that he do it again in the future? “Probably could in the future, but never had the opportunity at this point because Mark has such a great range and has a really nice clean voice. Which back in the day was the reason I started singing a couple of ballads because we wrote some and you know, I guess almost the band pointed at me and said ‘you try it’ because they knew I was singing a little bit, ’cause back then it made sense, it was kinda cool. You can listen to the whole of this interview on the Audio Player below and if you would like to win a pair of tickets for the ACCEPT shows in Finland, Peter said a secret code, fill the form with that code and you’ll have a chance to be one of our lucky winners. Finland has become the first country in the world to publish its own set of country themed emojis, according to independent.ie. They are to be featured as part of the Christmas calendar published by the Ministry for Foreign Affairs on ThisisFINLAND. This emoji collection contains important things associated with Finland and illustrates Finnish emotions. Some of the emotions are represented by an internationally known Finn. As a whole, these will reveal the weirdnesses and the strengths of the country and its people. The sauna, the headbanger, and the unbreakable (the Nokia 3310) are just three of the emoji that will be represented. Director for Public Diplomacy, Petra Theman, explains that emojis have revolutionised the way people communicate. “The Finland emojis were designed with a tongue-in-cheek approach, but I hope that they will tell the world not only about our special features but also something about our strengths. One example is disarming honesty,” Theman added. 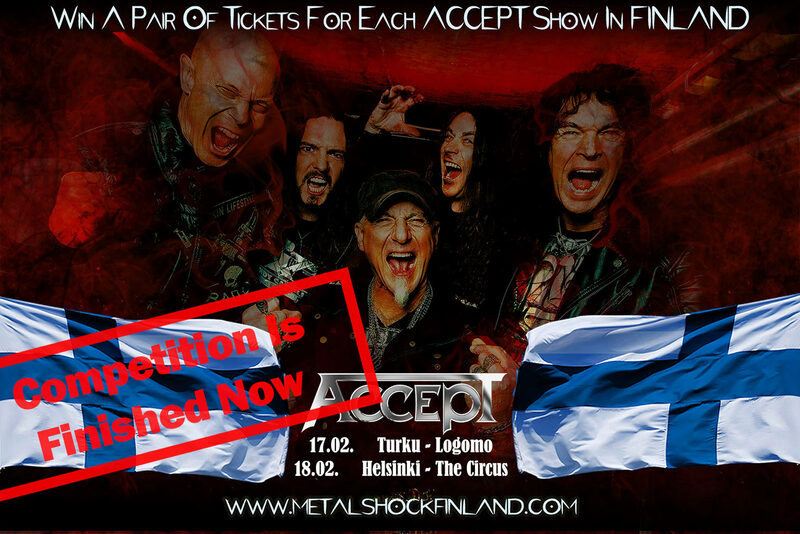 ACCEPT: Tickets Selling Fast For Finnish Shows! Jim Hauger – It was PERFECT… Their Heavy & Melodic RIFF HEAVY MONSTERS!!!! Claudio Aguilera – Best Accept concert I’ve seen in my life. Both guitars sounding Amazing. Tornillo’s voice is Superb. Mike McQuerter – It’s obvious you guys are not just going through the motions to earn a paycheck. The band sounds like a freight train crashing through a wall. The music is the tight and sounds dead on. I dare to say Accept is at a level it’s never been before and this is a good thing. Listening and watching Accept live really pumps you up and makes you feel alive. Well done guys. And you might wonder who is going to play last the first show, you can find the answer in the linked video. ROCK!! AMORPHIS‘ latest Finnish #1, The Beginning Of Times, has just gone gold (10,000 units) in their homeland of Finland. Amorphis’ follow-up to The Beginning Of Times, is being produced and mixed by no less than HYPOCRISY and PAIN mastermind Peter Tägtgren. Amorphis’ 11th studio album is planned for a March/April release via Nuclear Blast Records. Metalshock Finland‘s Tarja Virmakari met Steve (Drennan), Marcus (Sunesson), Magnus (Klavborn) and Jimmy (Olausson) from ENGEL, backstage of Myötätuulirock festival, which took place in Finland (Vantaa, Hakunila sports ground) on August 3-4, 2012, organized by Rockfest Finland Oy.